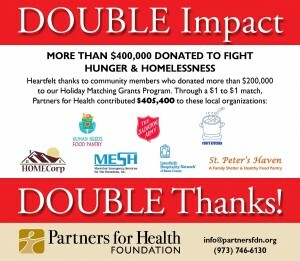 Community members opened their hearts and their wallets to help raise more than $400,000 donated through the Partners for Health Foundation’s Holiday Matching Grants program to seven local soup kitchens, food pantries and agencies that provide services to the homeless. Contributions of $202,700 from 438 individuals and families were matched dollar for dollar by Partners for Health, resulting in grants totaling $405,400. In January 2016, the Foundation distributed grants in Montclair to the Human Needs Food Pantry, Toni’s Kitchen, Salvation Army, HOMECorp, Interfaith Hospitality Network, and Montclair Emergency Services for the Homeless. St. Peter’s Haven in Clifton also received a grant. “This unparalleled generosity and support from the community quite simply allows us to continue our mission of providing food to local people in need,” notes Mike Bruno, executive director, Human Needs Food Pantry. “This grant will support the growing number of meals served, drop in center services and emergency lodging for after-hour requests for shelter,” Michele Kroeze of the Salvation Army adds, particularly critical during the first snowstorm of the season. “This gift will help us continue nutrition assistance to the working poor and strengthen our prevention program for seniors, enabling us to provide healthy food and other interventions that improve stability and prevent homelessness,” explains Anne Mernin, director of outreach for Toni’s Kitchen.